The Spirit of Carlton Past and Present is the official past and present players and officials association for the Carlton Football Club. Our mission is to bring together past players & officials and current players to renew and build the Carlton spirit and at the same time raise funds to help improve the Carlton team performance and team spirit by running major events on an annual basis. In addition to the above, we aim to provide welfare assistance to past players who are deemed to be in real need of support as well as to help preserve and present the history of the Carlton Football Club. This website is your resource to find all our latest news. Follow all our latest stories on our Blog. View information about our upcoming events on our Events page. Spend some time viewing our latest Videos. Get social with the Spirit of Carlton by following us on Twitter and Youtube. Also, find out about Membership information and feel free to Contact us with any enquiries. To bring together past players & officials and current players to renew and build the Carlton spirit at the same time raise funds to help improve the Carlton team performance and team spirit by running two major events on an annual basis. These are the golf day classic and dinner and a special theme luncheon. In addition to the above, to provide welfare assistance to past senior players who are deemed to be in real need of support. In late 2006 Bob Lowrie (CFC runner – late seventies and eighties) contacted a number of past players, coaches and administrators to entice them to get together to discuss informally the Carlton Football Club’s then precarious state and image in the AFL. Those who attended this get together included Robert Walls, Jim Buckley, Bob Lowrie, David Rhys-Jones, Ken Hunter, Geoff Southby, David Parkin, Steve Kernahan, Mark McClure, Mike Fitzpatrick, Val Perovic and Keith McKenzie with apologies from Alex Marcou and David McKay. There was a very united and passionate feeling amongst the group that they would like to in some way contribute to restoring and enhancing the spirit & culture of the Carlton Football Club in a non political way. Hence the slogan the “Spirit of Carlton” was born. With the Club entering into a new and youthful era, it was felt that it was a great time for past and present players, officials to get together and make every effort to renew or rekindle the Carlton Spirit, which was lying very dormant at the time. There was a strong feeling amongst the group that this initiative should certainly not be about living in the past, but about the future of Carlton and its forthcoming successes on and off the field. As a result this Spirit of Carlton group organised and ran two very successful functions in 2007. The special golf day and dinner in early 2007 enabled an intimate group of current players, past players and passionate supporters to get together on the day. It was highly successful in building the Carlton spirit and raising money to assist in the purchase of equipment and technology to enhance the current players’ spirit and on-field performance. Our guest Carlton speakers on the day were Robert Walls and David Parkin. Both were brilliant. The theme lunch event run in August 2007 was attended by 700 of the Carlton family including past players, current players, passionate supporters and sponsors. The lunch celebrated in 2007 the magnificent performances of our famous 7’s premierships, 1907, 1947 and 1987. It was a highly successful event attended by many of the past greats of Carlton, current players and five surviving members of the 1947 team, including captain, Ken Hands. 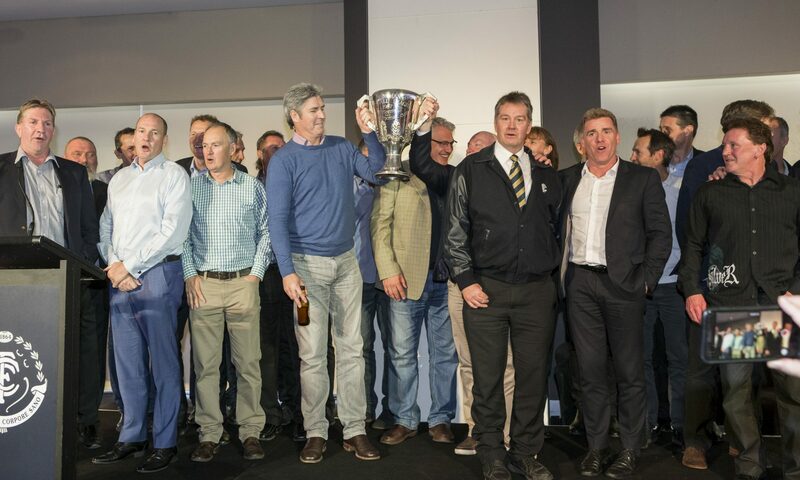 Eighteen of the 1987 premiership players were in attendance and Jim Buckley, a great former premiership player and the lovable larrikin of Carlton spoke with real passion on the day. In addition to the incredible amount of spirit and Carlton passion generated at these two events, in excess of $100K was raised of which a large proportion was donated to the CFC for new technology training and fitness recovery equipment for our players. In 2008, these two events were even more successful in terms of generation of the Carlton spirit and funds with almost 800 guests enjoying “The 1968 Breakthrough Lunch” at Telsta Dome, celebrating the 40th anniversary of the 1968 premiership, the first of eight premierships over the next 30 years. None of the 800 in attendance will ever forget the inspiring speech delivered by one of our ’68 premiership players, John “Ragsy” Goold. At our Golf Day dinner, we were fortunate to listen to a great address from our wonderful defender of the nineties, Andrew McKay as our guest Carlton “Spirit” speaker. In March 2008 at the Past Players Association AGM, there was an official amalgamation of the Spirit of Carlton group with the traditional past players association culminating in our new name. “The Spirit of Carlton Past & Present”. The outgoing president, Dennis Munari and former past players president Chris Pavlou who both had worked tirelessly in keeping the traditional past players association up and running, were there to see the hand over to a new era and exciting future for all current and past players, officials and passionate Blues supporters. In November 2006, within the confines of Giancarlo Caprioli’s University Café on Lygon Street, a hardened core of legendary Carlton Football Club figures convened for what was the first-ever meeting of the Spirit of Carlton movement. In attendance for that historic gathering were Jim Buckley, Mike Fitzpatrick, Ken Hunter, Alex Jesaulenko, Stephen Kernahan, Bob Lowrie, Mark Maclure, Alex Marcou, Keith McKenzie, David Parkin, Val Perovic, David Rhys-Jones, Geoff Southby and Robert Walls. Today, the following executive has been entrusted with the responsibility of keeping the Spirit of Carlton alive, through the Spirit of Carlton – Past and Present. Famous for his Norm Smith medal as well as numerous tribunal appearances, David represented Carlton in 106 games spread over 8 seasons, including the 1987 Premiership. Superbly skilled, fiery, volatile – these are all apt descriptions of the enigmatic David Rhys-Jones. Originally from Oakleigh Districts, David was signed by South Melbourne as an 18 year-old and made his debut for them in 1980. At 188 cm and 73 kg, he quickly established himself as one of the game’s tallest and best wingmen. He had pace, balance and wonderful aerial skills. One of the greatest full-backs of his or any generation, Geoff represented Carlton in 268 senior matches over 14 seasons, including the Grand Final victories of 1972 and ’79 under the leadership of captain-coaches John Nicholls and Alex Jesaulenko respectively. Considered the pioneer of full-backs of the modern era, Geoff was recruited from Sandhurst and made a stunning impact, taking out Club championship honours in his first two seasons of 1971 and ’72. A regular Victorian representative, Geoff was also named in a back pocket in the Blues’ coveted Team of the Century, rubbing shoulders with the League’s full-back of the century, Stephen Silvagni. Fondly remembered as one of the most consistent and spectacular high marks of his era, David “Swan” McKay was a Carlton star for twelve years, and a key member of four Premiership teams. David Nettlefold, began in the outdoor advertising industry over 40 years ago, working for Claude Neon and then Australian Posters before starting his first business, which was later sold to the United States group 3M. After a time out of the industry, he launched Nettlefold Advertising, a company that became the first strongly branded out-of-home media business in Australia. That was sold to the Hoyts group and, after various incarnations, most of that business is now found within APN News Media, which has Australia’s largest group of outdoor assets. His senior games tally might only total 41, but Dennis is a Carlton premiership player who was there when the 21-year drought was broken in the ’68 Grand Final against Essendon. Originally recruited to Carlton from Kilmore’s famed schoolboy football factory Assumption College, Dennis later turned out in 13 games for North Melbourne, but his allegiance always remained fixed with the Blues. More recently Dennis ably served as President of Carlton’s Past Players Association, and he continues to contribute as a valued member of the Spirit of Carlton – Past and Present’s executive. Alex was a member of Carlton’s fabled mosquito fleet of brilliant small men of the 1970’s and ‘80’s, and a three-time Premiership rover for the Blues. Recruited within the Blues recruiting zone, from northern suburban VAFA club Thomastown. Alex was a lightning-quick rover with sure ball-handling skills and excellent goal sense. Aged 20 on debut, by mid-season in ‘79 he was a regular in a powerful Blues combination that topped the ladder. In 1989 after retiring from league football, Alex played at VFA club Springvale, the club was being coached by premiership teammate Phil Maylin. He later returned to Carlton as an energetic and active member of the Past Players. In 2006 he was a popular – some would say overdue – choice for induction into the Carlton Hall of Fame.